Itsukushima Shrine needs no introduction. 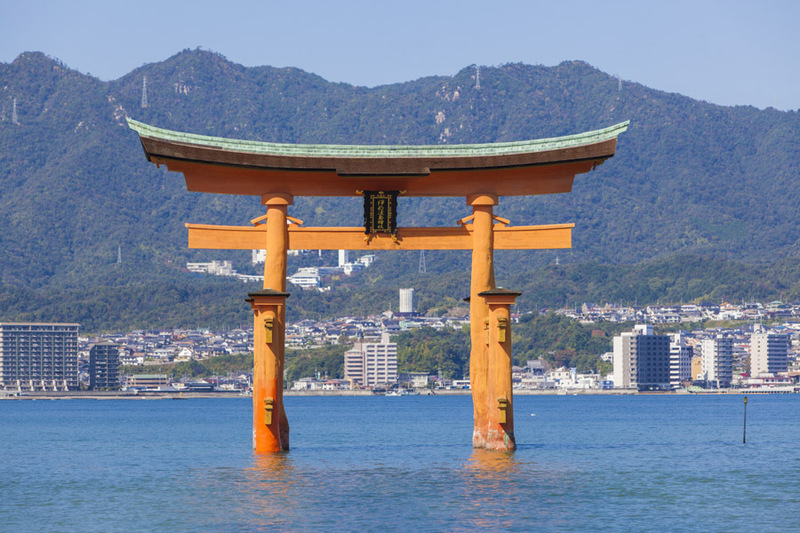 Its vermillion torii gate rising from the sea is an image recognized throughout the world. Every year millions flock to this small island off the coast of Hiroshima to marvel at the architecture and soak up the atmosphere of this World Heritage Site. The shrine – originally constructed in 593CE by Saeki no Kuramoto – was expanded into the structure you see today by legendary samurai lord Taira no Kiyomori. Itsukushima means “Island of Worship” and the whole island is considered a deity and worshipped as a god. It is the reason the shrine was positioned on the tidal sands to keep the sacred island itself inviolate. Today, the island welcomes ferry-loads of visitors to its shores, with most making a beeline for the famous shrine. Even with so many guests, the shrine still feels peaceful and your walk along its corridors becomes a meditation. The creak of the wooden floorboards, the sun reflecting off the sea underfoot, the intricate craftsmanship of the pillars and rafters overhead leave you lost in thought. As I approached the shrine, I was immediately struck by the wash of colors: the brilliant red vermillion of the buildings, the turquoise sea, the green and brown backdrop of Mount Misen’s forested slopes. Gazing from the shrine out to sea, the impressive o-torii gate looked firmly rooted in place as the waves broke against its formidable pillars. I was surprised to learn these heavy columns were merely resting on the seabed, held in situ by their own weight. Truly, a testament to traditional Japanese ingenuity. 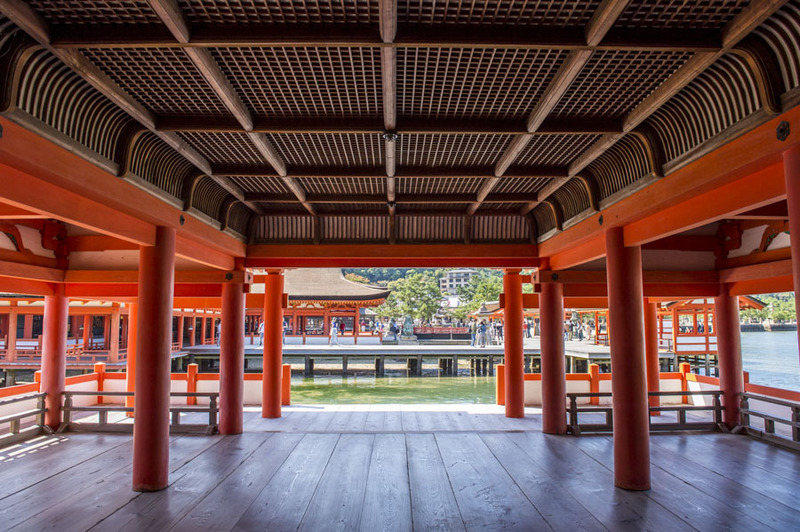 Four individual shrines make up the Itsukushima Shrine complex. 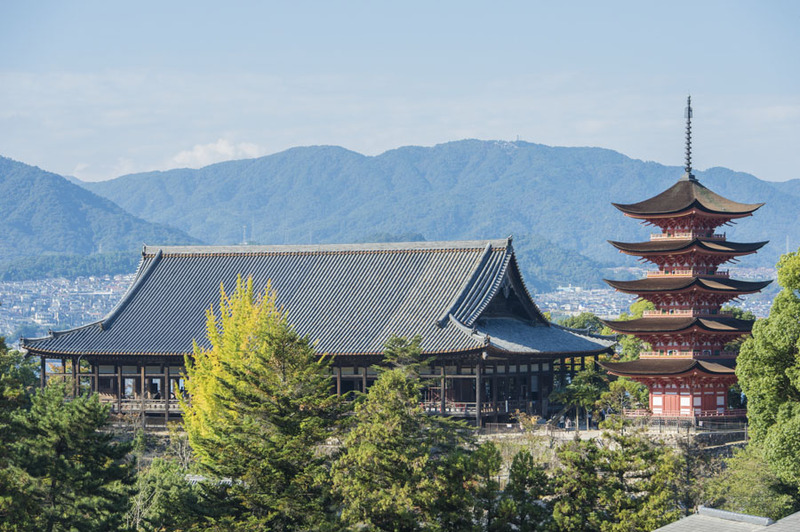 The highlight is the Main Shrine – one of the biggest in Japan and a designated national treasure. The Main Shrine venerates three female gods who preside over the sea, transport, fortune and the arts. From ancient times, Itsukushima Shrine has attracted pilgrims from all over Japan, but especially those with trades relating to the sea. 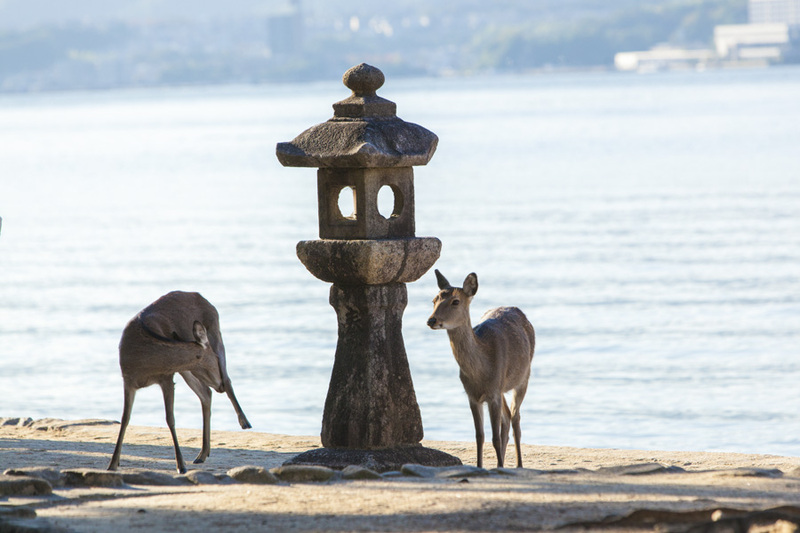 Sailors, merchants, fishermen would come to pray for safe passage through the Seto Inland Sea and protection from the elements. As I passed the Main Shrine, a shinto cleansing ritual was in progress. 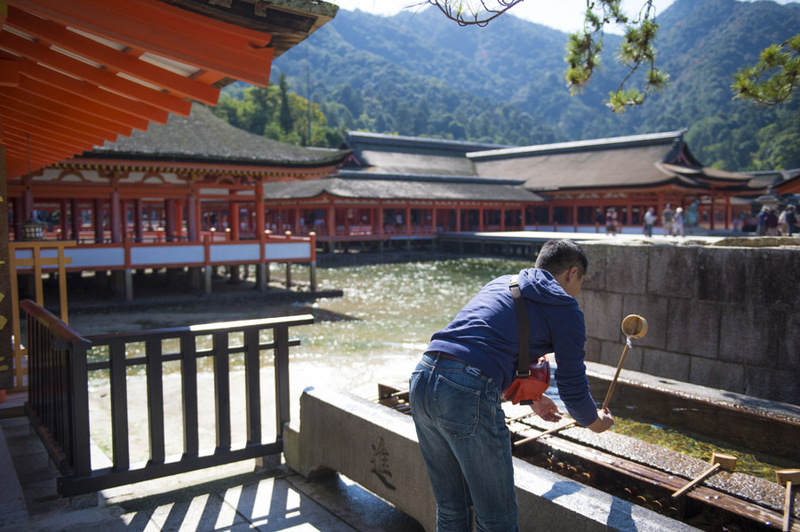 Itsukushima Shrine is a fully functioning shrine and worshippers come to take part in various shinto rites throughout the year. 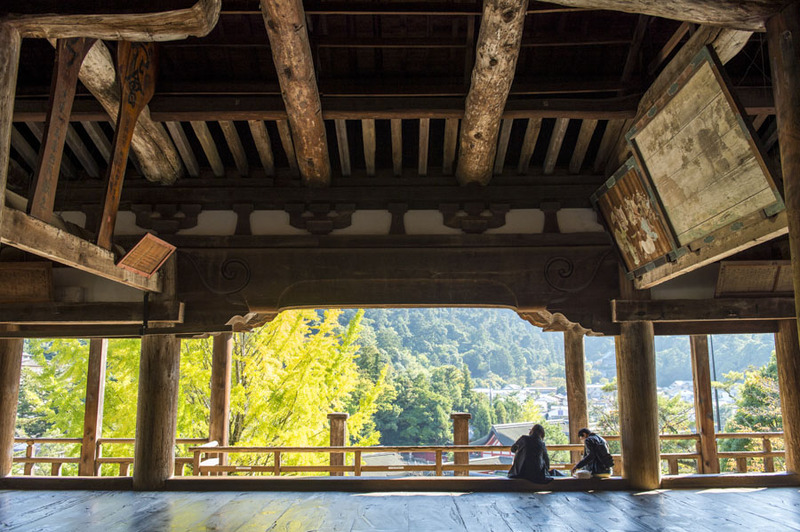 If you’re lucky, you might even witness a shinto wedding ceremony during your visit. By the time I reached the impressive Noh Stage, it was high tide. With the waves lapping at the wooden foundation pillars and walls set into the sand, the whole shrine appeared to be floating. There are two tidal shifts every day and their magnitude varies throughout the month. On a large tidal change, or O-shio, the sea retreats far enough to let you walk out to the torii gate. It is then you discover the true size and scale of the gate and its impressive pillars. You can check the daily timings for high and low tide at the entrance to the shrine. A short walk up the hill overlooking Itsukushima brings you to Toyokuni Shrine. It is the legacy of another famous Japanese warlord, Toyotomi Hideyoshi, known as one of the three unifiers of Japan. 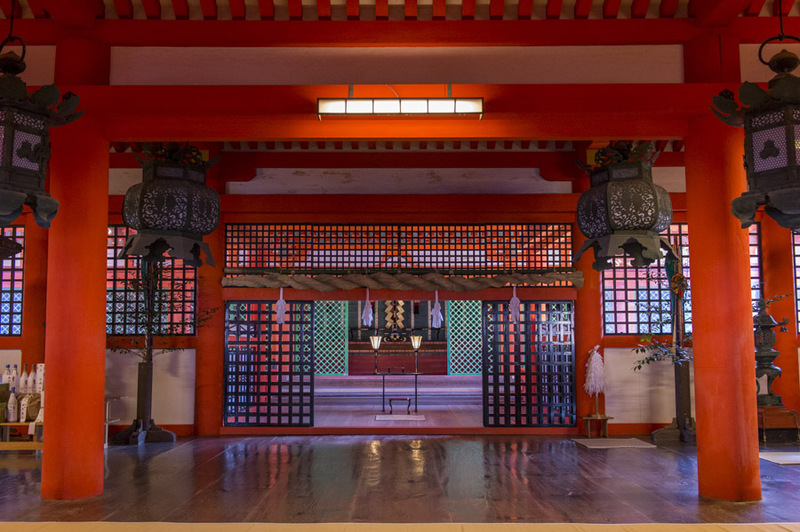 Due to its vast size, it is often referred to as Senjokaku, which means ‘hall of a thousand mats’. It was unfinished at the time of Hideyoshi’s death in 1598 and remained in its incomplete state thereafter. The result is an impressively vast and spacious, yet highly unusual temple. The roof is completely exposed, revealing the massive rafters and beams that support the weight of the imposing roof. I visited on a warm autumn day. A refreshing breeze flowed through the open hall and the reflection of a bright yellow ginkgo tree played on the shrine’s polished floorboards. Next to Senjokaku, a bright red five-storied pagoda dominates the skyline, clearly visible from the ferry as you approach Miyajima. The bright lacquer on this pagoda is unlike anything I have seen before. Make sure you take in the view from the top of the hill down to the shrine complex – a moment to savor and photograph. As I climbed down the hill and explored the shops, the sun was fading slowly to the west. The time of day reveals the shrine in a different light. They say the best views of the torii gate are at sunrise and sunset. As I picked out my ideal spot on the shore, the sun was slipping towards the horizon. The light blues and greens of the sea turned into a dark velvet. Gentle swathes of reds and oranges began to spread across the sky. The torii gate, highlighted by floodlights from the shore, created a majestic image. As I sat and observed the changing colors that evening, I became aware of the harmony between the gate, the shrine and the natural world. Even though this enormous manmade wooden structure stands on its own in the middle of the sea, it somehow remains at one with its surroundings regardless of weather, tide or time of year. However many pictures you see of Itsukushima Shrine and the torii gate, nothing matches a visit in person. You need to wander the corridors, observe the colorful architecture and breathe the air in Miyajima to truly appreciate its magic and allure.